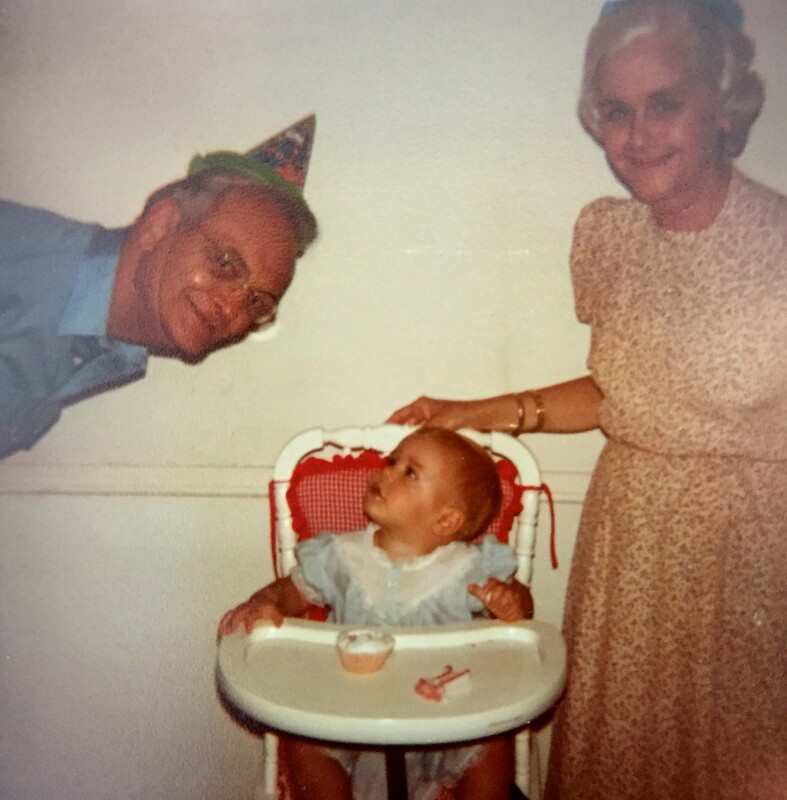 My father as photo-bomber, with my mother and my niece “Labba Lee,” circa 1980. Of the thousands of photographs and slides to survive the years of heat and dust in My Mother’s Attic, my favorites are those that feature my father as a young man. I wish there were more. I’ve never seen a likeness of Dad as a baby or a young child—inconceivable in this age of photo op overload. 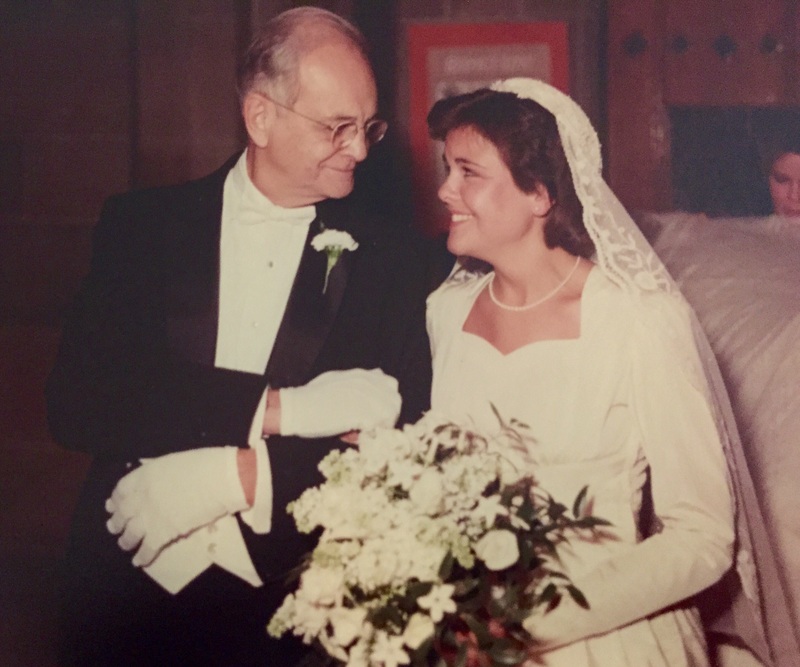 The shots I do have reveal a confidence and affability those who knew my father later might expect, but they also hint at a deep silliness that Ed Mattingly, successful man of business, reserved mostly for his family. Consider his favorite means of waking me on high school mornings: As I lay curled in the last luscious moments of teenaged dreamland, he would poke me between the ribs and say the word, “asamunigots!” which really is not a word at all. Having rustled many a teenager out of bed in the years since, I do not recommend this method. It’s a wonder I didn’t haul off and slug him. But “asamunigots”? What does that even mean? We never knew. I don’t think it occurred to my siblings and me that it meant anything at all. It was just one of those things Dad said, and did. The word never came without the poke, and the poke never without a funny flick of his wrist. We saw the flick and the long fingers and knew what was next, but there was no squirming out of his reach. My father was quick as greased lightning. 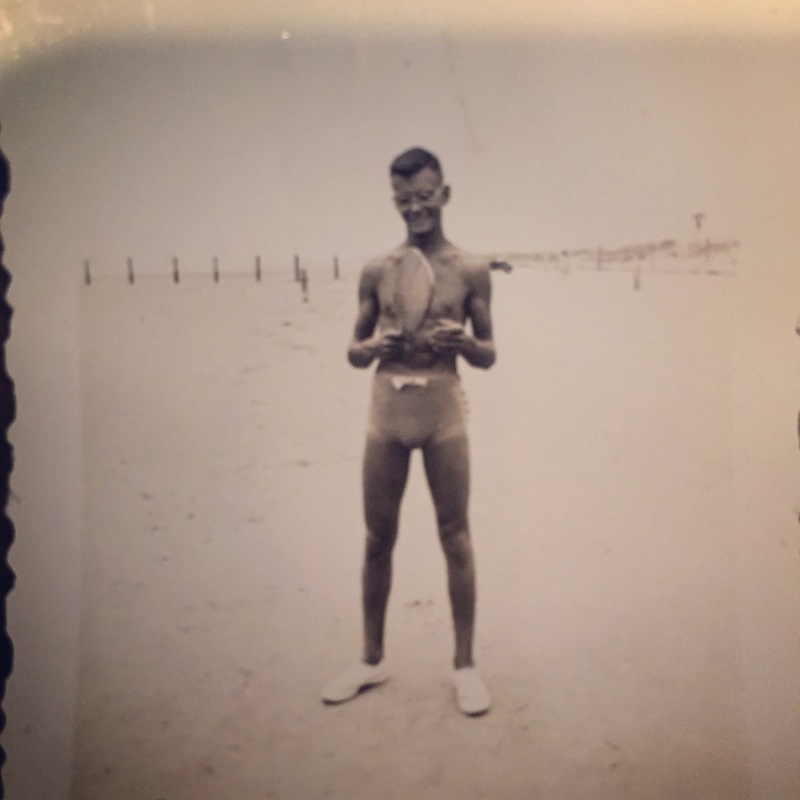 Dad on a bad swimsuit day, long before he became a dad. Circa 1935? 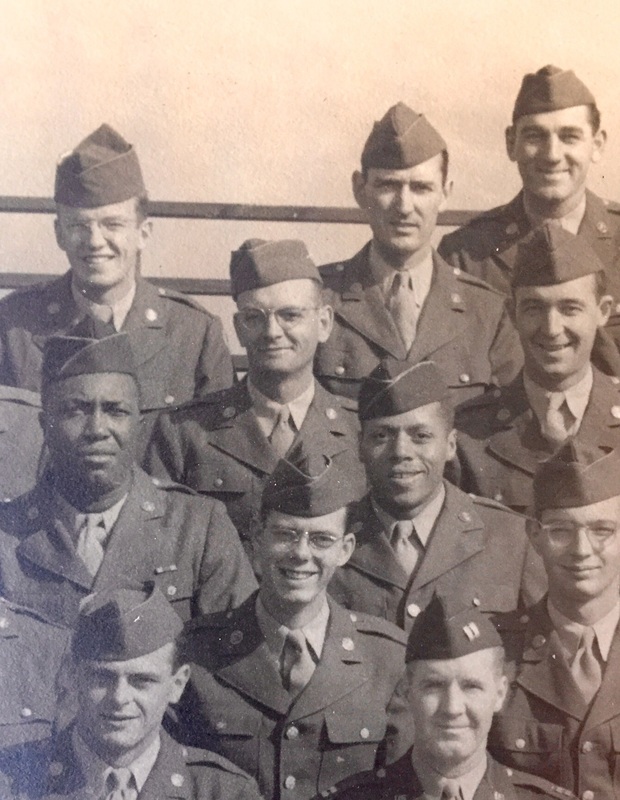 Cadet Mattingly, 4th row up, left of center. Come to think of it, our young lives were peppered with Dad’s whimsical wordplay. We vacationed each summer in the Smoky Mountains and sometimes, as we walked together down a rutted back road, he’d stop short, a devilish grin on his face, and cry out, “Dahn-ge-ru Skip-awah!” I’d laugh and look up and there it would be–written in red across a chain link fence: “Dangerous. Keep Away.” Dad’s favorite summer drink had three syllables: “Ice-ed Tea,” Our fiftieth state was “Ha-wa-yah,” a good seafood dinner “Shrimp-us,” and the topping he preferred on every dessert? “Whupp-ed cream.” My father favored nicknames, too. Whether you had one or not made no difference. He was glad to oblige. My nieces and nephews, my children, took on fresh personas for him–Laura Lee became Labba Lee, Liz, inexplicably, was Hootie, Sam, Sambo. 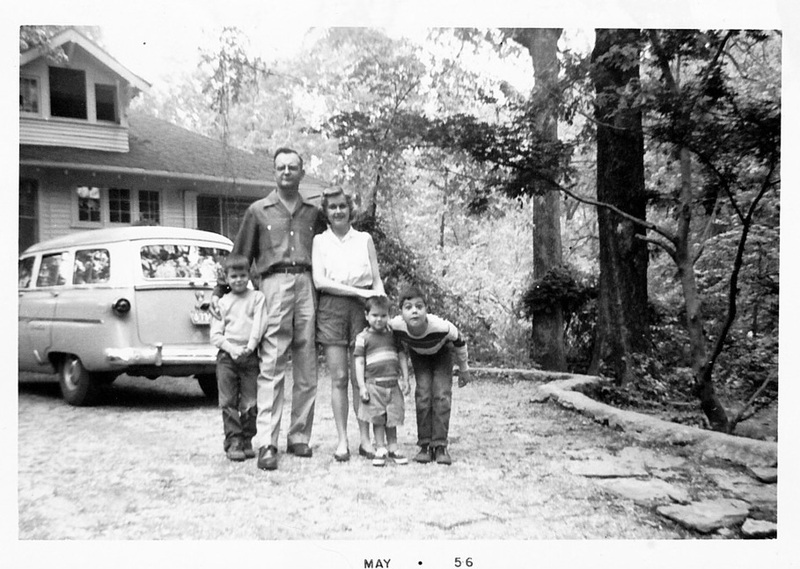 Matthew was Mattu and the six-foot, four-inch tall grandson remained always Little Ed. Dad didn’t stop at family either. Fellow insurance agents became Buzz and Podner, and perhaps my personal favorite, he dubbed his old pal George, The Egghead Flash from Newnan, Flash for short. 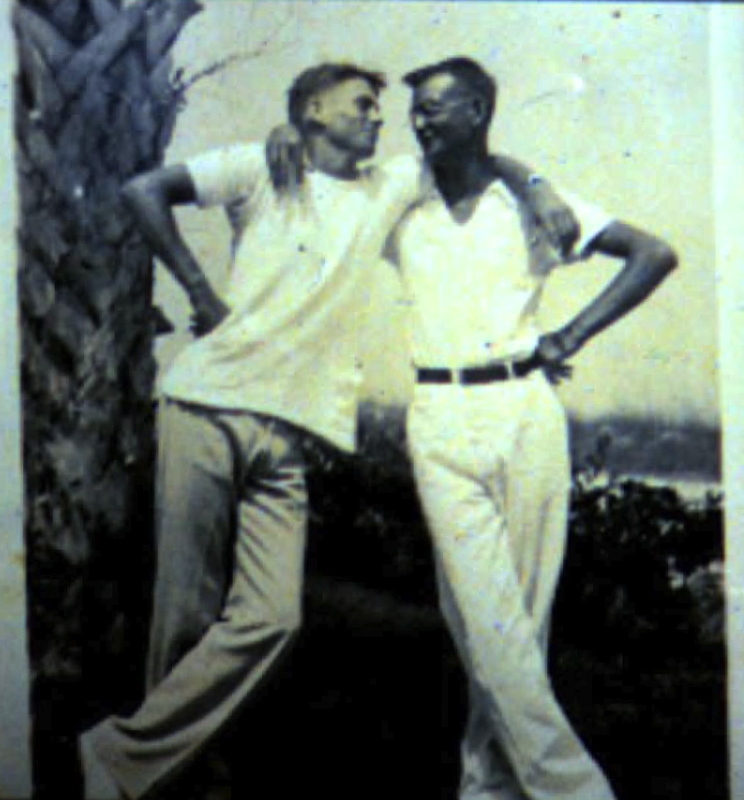 As a young man, Dad (at right) had his nicknames, too–Matty, E.H., sometimes just plain “H,” for his middle name, Hagan. It’s funny, the things we remember about our childhoods, and the things we don’t. My father never said much about his upbringing. We knew only that unlike ours, his was motherless and unstable, filled with challenges, even tragedy. What details we did glean came mostly from cousins or aunts and uncles who stood helplessly by as Dad and his brother and sister were shuffled away from their troubled father and in and out of orphanages until they landed in the capable arms of my Great Aunt Louise. I’ve only just begun to read through some of the letters The Attic has coughed up from this period in my father’s life, but already I sense this much–The Twenties failed to roar for his family, and though its clear that loving people had an eye on him, there was little levity in his life. 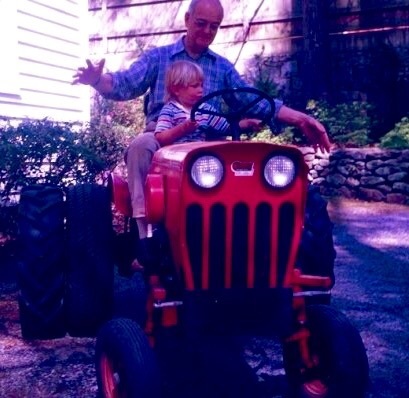 Grandson Ben takes the wheel, circa 1988. And yet, he ended up with this playful sense of humor, a knack for putting others at ease. My father had his faults. He liked things done a certain way–his way–and my brothers remember a quick disciplinary hand, but he was not a bitter man. His humor never became biting or sarcastic, and though he could be Mister Gloom when it came to foul weather or the failings of his sports’ teams, he believed deeply in humankind’s basic goodness and strength of will. We, meaning the inhabitants of God’s Green Earth, he believed, would persevere. Dad’s brood, ’roundabout Fathers’ Day, 1993. 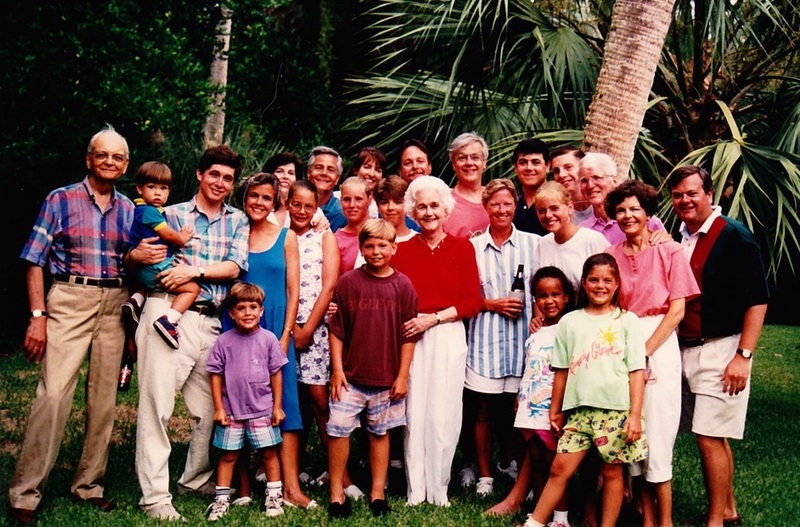 Two grandchildren–my daughter and youngest son–and fourteen great-grandchildren (so far) were yet to come.